Here are some common terms that renters will encounter when they're leasing an apartment in Gainesville, FL. This refers to items of convenience or enjoyment that are provided by the apartment usually at no cost. An example of some common Gainesville apartment amenities are: swimming pools, club house, fitness center and apartment balcony. This is an amount of money that is required to be paid when signing the lease on your new Gainesville apartment. The deposit is to protect the apartment owner from the possibility of future damages or default on the lease. Your deposit is returned to you in some fashion, it may be applied to future charges or returned when you vacate the apartment. These are apartments that contain some items of furniture rather than requiring you to supply all furniture. A typical furnished Gainesville apartment bedroom will have a bed, night stand, desk, chair, dresser of some sort and a lamp. A furnished Gainesville apartment common area will generally have a sofa, coffee and/or end tables, dining room table and chairs. 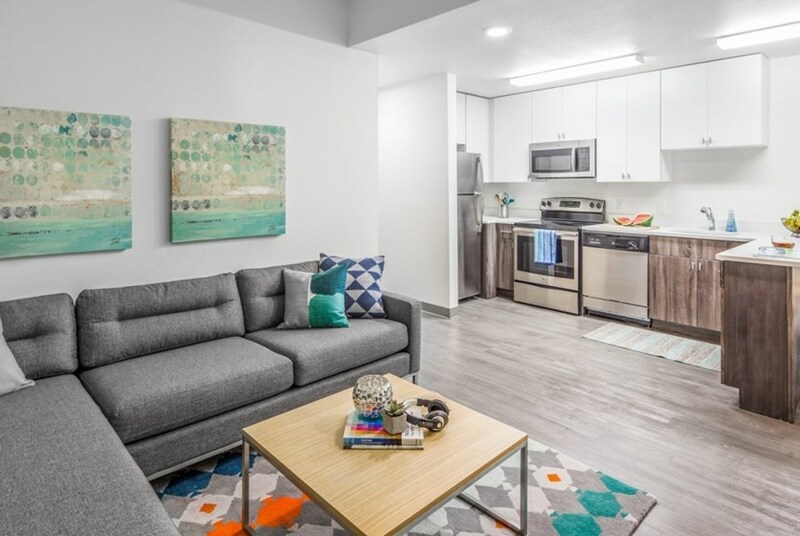 Keep in mind that all Gainesville apartments with kitchens typically include a refrigerator, stove top, oven and microwave regardless of whether it is furnished or unfurnished. Every apartment is a little different in what it does and does not provide so check with apartment staff and carefully read your lease before signing. Things that are not typically included in a furnished apartment are: dishes, cups, silverware, pots, pans, linens, towels, pillow, blankets, phone, vacuum, iron or ironing board. You will need to supply these items. Note: a furnished apartment is not the same as an extended stay hotel. An extended stay hotel is often furnished similar to a furnished apartment but the lease/rent terms are typically very different. An extended stay hotel is intended for stays of one week to one month, and the rates are usually significantly higher than an apartment which is intended to be rented for 6 months to one year minimum. Guarantor (also called a co-signer). A person that agrees (in writing) to pay your lease and associated expenses if you default (are unable to pay) on your lease. The guarantor will be responsible for the full amount remaining to be paid on the contract if you default. A guarantor may be required when applying for a lease if you are not able to demonstrate a history of good credit or an income capable of paying the rent. Keep in mind that your guarantor will need to demonstrate the good credit history and income that you might be unable to demonstrate. Your lease is a contract between you and the Gainesville apartment. This contract will spell out the legal requirements and limitations for both you the renter, and the apartment owner. This document will also define what you are able to do (and not do) to continue living in the apartment. It will cover the process for you to leave and how the owner can make you leave (evict you) if necessary. READ AND UNDERSTAND YOUR LEASE BEFORE SIGNING! We can’t stress this enough, trying to negotiate with the apartment owner after you have signed your lease (thereby agreeing to the terms) puts you in a very difficult position. If you are unable to understand the language we recommend hiring a lawyer trained in this area to assist you. This is the amount of money that a bill exceeds a previously agreed upon maximum total allowed. For example, your Gainesville apartment may pay for your electric bill up to a certain amount (say $200). If one month your electric bill is $240, then the overage amount is $40 and you will be responsible for repaying the $40 to the apartment owner. This is put in place to protect the owner from excessive use. A rental agreement less than 1 year. Apartments in Gainesville typically rent for 1 year, anything less is referred to as a short-term lease. Because of the added expense to find and prepare the unit for another renter, short-term lease rates are typically more expensive than the 1 year rates. This is a nine-digit number issued by the United States Social Security Administration. SSNs are issued to U.S. citizens, permanent residents and temporary working residents. The primary purpose of a SSN is to track individuals for tax purposes. This is an apartment in which the original renter has left before the lease ended and that original renter is renting the apartment to somone else for the remainder of the lease. In this situation you are renting from the previous renter, not the Gainesville apartment owner so be very careful. Many apartments in Gainesville will not allow a sublet for a number of reasons. For an international student looking for a first type apartment in Gainesville, we would not recommend this option. For one, if you sublet an apartment and the original renter fails to pay the original rent - even if you have paid your rent to the original renter - you can be evicted from the apartment. If you do choose to rent a sublet, make sure you check with the Gainesville apartment staff to make sure this is legitimate before proceeding. This term applies resources provided by a regulated industry to consumers for a fee. Common Gainesville apartment utilities include: electric, phone, cable TV, internet service, water, natural gas, sewage and trash disposal. Some apartments in Gainesville will include certain utilities in the rent, while others will require you to set up service with the utility company yourself. Each apartment in Gainesville is different so use our real-time Gainesville apartment search page to see what amenities, utilities, and other specific features are currently available at each apartment. « Return to Apartment Resources for International Students.